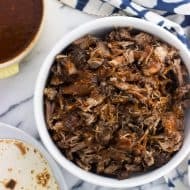 Slow cooker shredded beef is easy to make and versatile to use in sandwiches, over rice or salads, and more! It cooks in a balsamic peanut sauce that tastes amazing made in the crock pot. When it comes to the slow cooker, I like to think of myself as an equal opportunist. 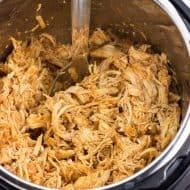 Just on the blog alone there are slow cooker recipes for chicken, soups, a side dish, an appetizer, and even apple pie! But today we’re talking about beef. A chuck roast to be precise, but we’re not cooking it up pot roast style. Instead we’re letting it spend a few extra hours in the slow cooker until it can shred easily with just two forks <– worth it! Promise. 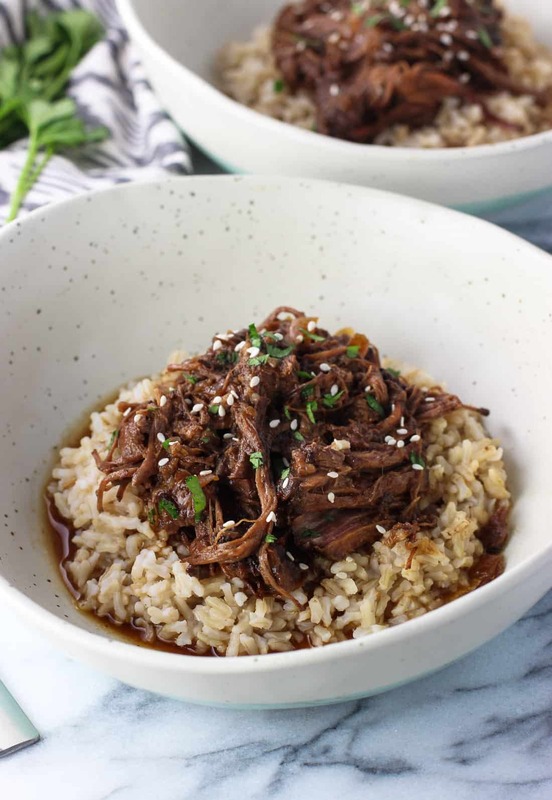 As it turns out I didn’t intend to pick up a chuck roast when I made this slow cooker shredded beef. Lately I’ve been responsibly winging my meal planning and choosing proteins based on what’s on sale in the meat department. Chuck roast was it this time! 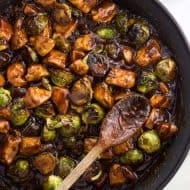 A big three-pound one, which typically isn’t my first choice as that’s a lot of meat for just the two of us, but with the balsamic peanut sauce (from this post) in mind, I knew making leftover portions disappear wouldn’t be a difficult task. Don’t be dissuaded by the fact that it cooks for so long – seven/eight hours on high. Chuck roast takes awhile to reach that ‘fall apart’ stage, but when it does – YUM. So more on the sauce. There are multiple flavors going on here, but they complement each other so well that one doesn’t overpower or distract from the rest. Which is great, but it makes it tough to come up with a name for it! I went with balsamic peanut sauce, but the balsamic vinegar and peanut butter aren’t ultra prominent. 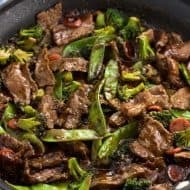 Rather they round out the sauce perfectly when combined with soy sauce, brown sugar, sesame oil, garlic, ginger, and sriracha. With one tablespoon of sriracha used here, there’s a very mild spiciness to the sauce. If you’re a big fan of all things hot and spicy feel free to add more! Chop onion and place it in the bottom of your slow cooker. 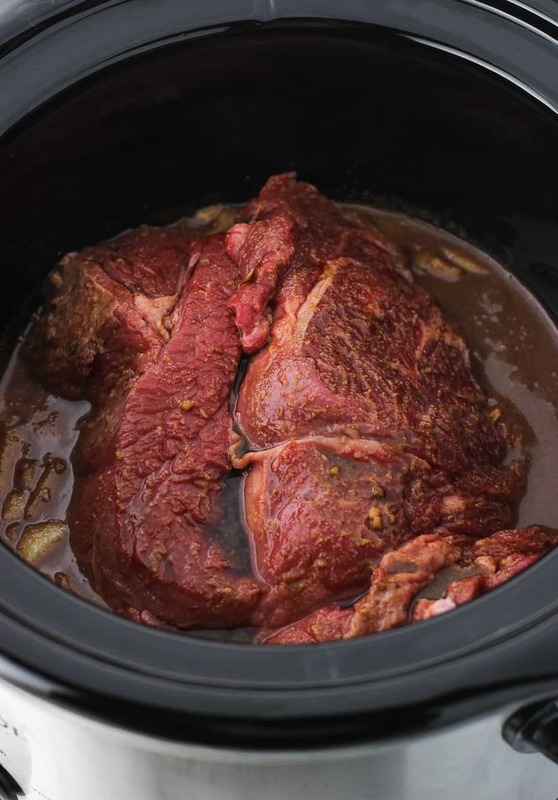 Trim fat from chuck roast (if you prefer) and place it in the slow cooker. Whisk together all other ingredients in a bowl and once smooth, pour into the slow cooker over the roast. Cook on high heat for 7-8 hours, or until the roast can easily shred with two forks. Shred everything and stir the shredded beef around with the cooking liquid. Serve over rice, in tacos, on salads, on sandwiches, etc. Nutritional info is an estimate based on trimming the visible fat on the chuck roast and is for the meat and sauce ingredients. Rice or whatever you serve it with/over is not included. Balsamic peanut sauce???? That sounds SOO good! 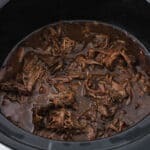 I’ve been using my crockpot like crazy lately – must try this! 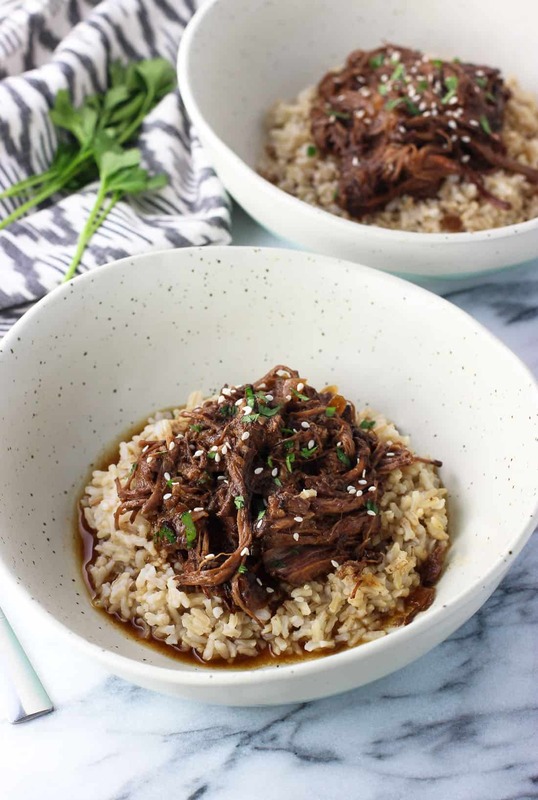 I don’t make beef in my slow cooker enough — I need to change that! This meal looks so comforting and delicious, which is perfect for all the rainy days we’ve been having! Thanks Marcie! My usual go-to is chicken, but I think this chuck roast was a game-changer. Delicious! 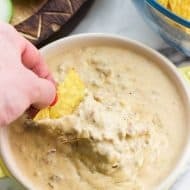 We’ve been making big batches of food to each during the week and I need to add this one to the list! 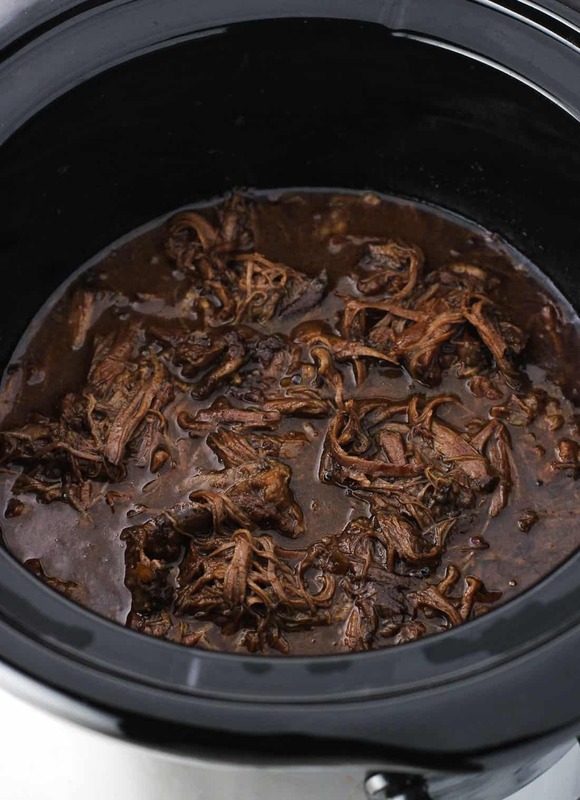 I love cooking meat in the slow cooker all day too, it’s the best! Thanks Danielle! I bet you will love this! I love it! I like to think of myself as an equal opportunist when it comes to my slow cooker too (though I think I need to work on the desserts). Beef is one of my favorite things to make in it, so this version is calling my name. Love that peanut sauce, Alyssa! Sounds so flavorful! I’d love to get into slow cooker desserts more, too! I just have the one recipe on the site haha. Thanks Gayle!